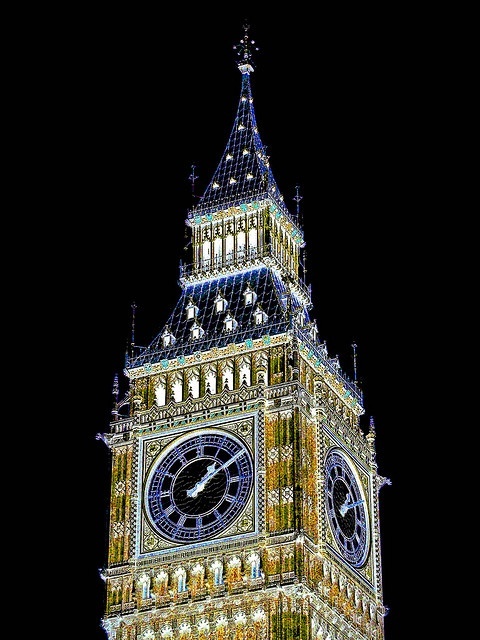 Big Ben is the nickname for the great bell of the clock at the north end of the Palace of Westminster in London, and often extended to refer to the clock and the clock tower. The tower is now officially called the Elizabeth Tower, after being renamed in 2012 (from "Clock Tower") to celebrate the Diamond Jubilee of Elizabeth II. The tower holds the largest four-faced chiming clock in the world and is the third-tallest free-standing clock tower. The tower was completed in 1858 and had its 150th anniversary on 31 May 2009, during which celebratory events took place. The tower has become one of the most prominent symbols of both London and England and is often in the establishing shot of films set in the city.